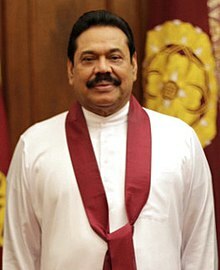 Mahinda Rajapaksa (born 18 November 1945) is a Sri Lankan politician. He is the current Prime Minister of Sri Lanka since 26 October 2018. He also was the 6th President of Sri Lanka. He was president from 19 November 2005 to 9 January 2015. ↑ "Mahinda Rajapakse". Encyclopaedia Britannica. Retrieved 9 August 2017. ↑ "Mahinda Rajapaksa sworn in as Prime Minister". adaderana.lk. 26 October 2018. Retrieved 26 October 2018. This page was last changed on 8 April 2019, at 15:32.